BATAVIA, Ohio (Feb. 28, 2018) – Clermont County Commissioners today approved a waiver of building permit fees relating to the reoccupancy of buildings and structures impacted by the recent severe storms and flooding the county has experienced. Fees will be waived through March 16. Commissioner David Painter and New Richmond Village Administrator Greg Roberts held a news conference today (Feb. 28) to brief the media and the public on flood recovery operations and available help for residents in the impacted communities. 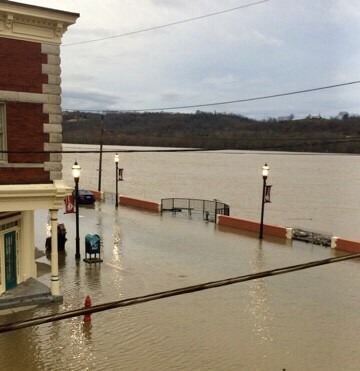 A town hall meeting for residents of ALL communities affected by the flooding will be held at 6 p.m. Monday, March 5, at the gymnasium at Market Street School, 212 Market St., New Richmond. Officials will be on hand to provide information and answer questions. PROPERTY DAMAGE: The county building department is assessing damage. Today the Board of County Commissioners approved a resolution to waive building inspection permit fees relating to the reoccupation of buildings affected by the flooding. But you WILL need an inspection and permit related to the reoccupation of the evacuated buildings and structures. UTLITIES: To get your utilities reconnected, first make sure ALL floodwaters have receded, including from your basement. Then, clean your mechanical & electrical devices. After that, call the Building Department at 513.732.7213. They will take your application and start the process. PERSONAL NEEDS ASSISTANCE: Anyone in affected areas with personal unmet needs should contact American Red Cross flood hotline at 513.579.3048. DONATION DISTRIBUTION: A donation distribution site is set up at First Baptist Church of New Richmond, 213 Western Ave.
Matthew 25 Ministries will be there daily 9-6 through Monday. They are distributing cleaning supplies and hygiene supplies. Their partners include P&G, Tide, and Cintas. Tide Loads of Hope Laundry trailer is on site to help with laundry needs. DONATIONS: Salvation Army is accepting donations at its 6 area drop-off locations. Those locations are open 9 a.m.-4 p.m. They are accepting clothing, cleaning supplies and non-perishable food. VOLUNTEERS: Any organization or individual who wants to volunteer should call the Clermont County Emergency Management Agency at 513-735-8500. Your information will be taken and we will be getting back to you. The need for an organized Volunteer Cleanup Day is being assessed and more information will be forthcoming.